Today was Day #2 of Chocolate, Seeds and Berries Theme Week. I'm from California, and am proud to live in the "land of fruit and nuts." I lived elsewhere for a time. However, I was never so happy as when I returned home and had access to fresh produce again, from trees in yards, nearby markets, or the occasional road stand. Even better, has been the access to so many items -- such as seeds and berries -- that grow in the Golden State that combine so nicely with chocolate. Sesame seeds grow in the Middle East, Asia, and elsewhere, and can be used for either sweet or savory foods. They appear in desserts and dishes from many different cultures in the San Francisco Bay Area. 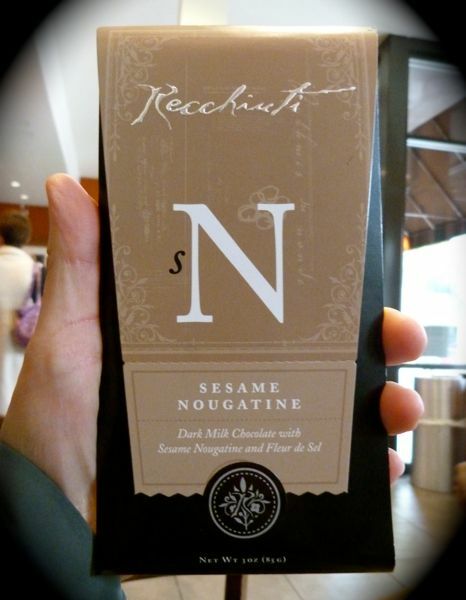 Today I tried a dark milk chocolate, Sesame Nougatine bar, from Recchiuti Confections (San Francisco, CA)*, a variation on Recchiuti's Sesame Nougatine Truffle. 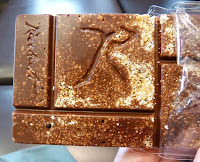 Bursts of toasted sesame seed clusters, cooked with cane sugar and sea salt (fleur de sel), poked out of this bar. 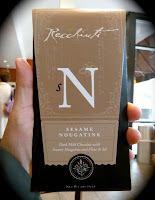 The chocolate was fairly smooth -- no strong or acidic notes; however, the initial flavor (bites of chocolate without sesame seeds) was not quite what I expected. It could have been the vanilla extract I was tasting. I enjoyed the slightly crunchy areas of sesame nougatine. The sweet and salty flavors were subtle and well balanced. 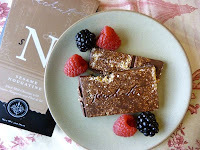 The fresh raspberries and blackberries that I paired with this bar seemed to improve the overall taste of the chocolate. *Note: Michael Recchiuti and crew operate a "Chocolate Lab" in San Francisco. Watch for a future write-up or on this Lab location and tasting space.